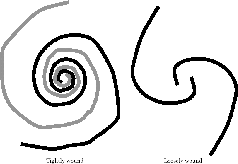 Figure 3.3: Tightly wound (left) vs loosely wound (right) spirals. Generally speaking, the epicyclic frequency depends on the rotation law but is in the range of (see Table 3.1 for for typical rotation laws). It is shown that the system is stabilized due to the epicyclic frequency compared with a nonrotating thin disk [eq.(2.65)]. Table 3.1: Epicyclic frequency vs rotation law.